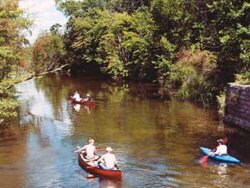 AThe Chippewa River in Michigan runs approximately 80 miles through the central Lower Peninsula. The main branch of the river begins in Barryton where the north and west branches are impounded before flowing south and east into two different lakes in Isabella County, Lake Isabella and Coldwater Lake. A tributary, Coldwater River, merges approximately 3.5 miles southeast of both lakes. The river flows east into Midland County where it joins the Tittabawassee River in downtown Midland, Michigan under The Tridge. The river is named after the Chippewa people (the Saginaw Chippewa Tribal Council is located in Isabella County). The river flows through Mt. Pleasant and is the focal point of four parks in the city: Riverside Park, Millpond Park, Nelson Park, and Island Park. In Island Park, the river flows completely around the park and creates a natural island in the center of the city. Three additional Isabella County parks utilize the river for recreation: Meridian Park, Deerfield Nature Park, Chipp-A-Waters Park, and Majeski Landing. The river flows at an approximate speed of 5 mph and an average volume of 284 ftÂ³/s. It is locally known for bass fishing. Chubs and redhorses are also abundant. The liveries offer canoe and kayak trips for a few hours to all day. The river flows through a gravel pit named Hubsher Gravel Pit. The river is a main water source for the city of Mt. Pleasant..